Habitat for Humanity is building nearly 150 new homes for low-income victims of Hurricane Andrew. 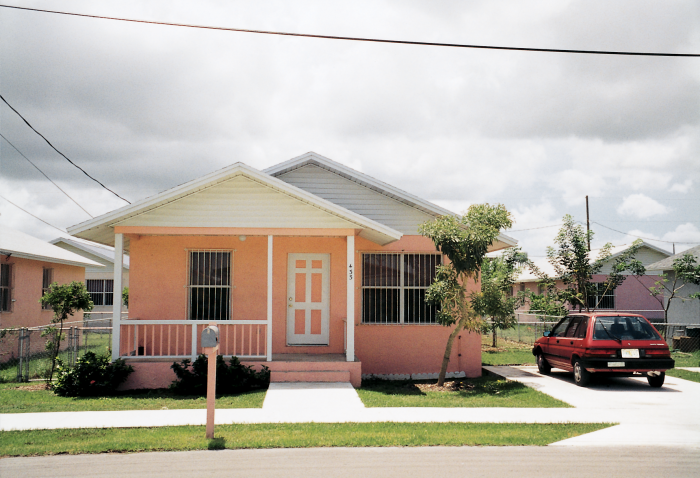 The goal of the project is an energy-efficient neighborhood to stand as a benchmark of affordable housing in Florida. Jordan Commons in southern Dade County is an innovative, energyefficient housing development being constructed for low-income victims of Hurricane Andrew. The goal of the project is to build an energy efficient neighborhood to serve as a model for affordable housing in Florida. Habitat for Humanity is developing the 40-acre tract and will oversee the construction of nearly 150 homes. Perhaps most importantly, the households that incorporate the efficiency features are being monitored for one year to document their energy savings—a proof-of-concept seldom attempted. With support of the Florida Energy Office, FSEC is monitoring 10 homes in the energy-efficient development and comparing them with 10 control homes without energy-efficient features in nearby Florida City. Household power use, building conditions, and meteorological conditions will be monitored in both neighborhoods. Temperature measurements are obtained using type-T thermocouples. The ambient air sensor was shielded from direct radiation by placing it inside a vented enclosure. Capacitive-type humidity transmitters provide temperature compensated RH readings. Cupped wind speed anemometers are mounted one meter above the roof line. Insolation is measured using a horizontally mounted silicon-cell pyranometer located on the rooftop. Window ventilation is obtained from magnetic contact switches mounted on the operable windows that send signals back to the datalogger. Electrical power consumption was assessed using eight 50- and 200-amp, pulse-initiating power transducers. CR10 dataloggers read instrument data at 5-second intervals. Integrated or totalized values are stored every 15 minutes. Data are transferred from the dataloggers to a mainframe computer each evening and automatically plotted to summarize the daily performance parameters measured at each site. The project engineer reviews the plots the following morning to ensure reliable data collection. FSEC research engineers audited the 10 control group sites with dataloggers and associated instrumentation installed in July of 1994. To our knowledge, this effort represents the most ambitious collection of energy end-use data in low-income housing in North America. Before we installed the instrumentation, many predicted that energy for heating water would be greater than any other energy use in the homes. Hot water use is strongly linked to occupancy, and the control houses average more than four persons per household. However, the data showed that nearly half the energy used was for air conditioning. The next largest use, water heating, was much lower at 18 percent. So much for pre-monitoring speculation. As we further examined the air conditioning data, an intriguing fact surfaced: among the 10 control homes, which are nearly identical, the AC use varied by 5:1. Again, however, the detailed data allowed clear insight into the differences. We found that the thermostat setting explained more than 80 percent of the difference in AC energy use from one home to the next. For each degree the thermostat was set below 81°F, the AC use increased by 12 percent. Based on such data, we have been able to make better informed decisions to improve construction of the efficient homes. But the real test is just beginning. With Jordan Commons now under construction, FSEC will be installing the monitoring equipment for the 10 experimental homes. At the end of one year of comparative monitoring, the accumulated data taken at Jordan Commons will be analyzed against that taken from the control group homes in Florida City. The results should allow the verification of performance of the energy-efficiency measures and serve as the basis for improving affordable housing in Florida into the next century.